If you’ve read up to this point, do you suspect I might have spoken heresy about the past and the present? Shouldn’t we just try to recapture some of that good old hard structure which gave us comfort and surety? This basic and necessary societal function has changed dramatically and will continue to do so at least for the next decade. There are far fewer generalists, family doctors and almost no house calls. The positioning of health care services is different — we now have emergency clinics sprouting up everywhere, generally taking on such names as “Neighborhood Emergency Clinic”, or “NextCare.” There are approximately 7,000 such clinics in the United States today. They charge the same or more than hospital emergency room rates, relying on your frustration of not being seen in time at a regular hospital. Electronic Health Records (EHR) are bringing huge changes and will affect the doctor-patient relationship because many more people will have access to patient records. Libraries were go-to places for knowledge acquisition. They still exist but are supplemented by the new social process of gaining internet-based knowledge from wherever you are. This has led to incredible smartening of the general population and incredible dumbing–down at the same time. Indeed, the notion of what passes for knowledge has drastically changed. Today’s knowledge is not presented in structured buckets sporting labels of “peer-reviewed”, classic” or “pop culture”— it’s just there. The burden of assigning values to different types of knowledge rests with the acquirer. Unfortunately, therein lies the downside. Members of society seem to have a problem distinguishing between absolute and relative truth, historical fact, news, opinion and other categories of “knowledge.” The so-called “fake news” phenomenon that has been popularized by the current administration is a calling-out of the confusion that is prevalent in media reporting. The third example of changing social structure is language. Without going into structural linguistic theory, Ferdinand de Saussure and all the greats, suffice it to say that the English language has taken considerable hits since the last century. The way we pronounce many words in our language has changed significantly. Words have disappeared over time and new words have entered the language. Currently, there are almost 172,000 words in the English language along with nearly 48,000 obsolete words. Our language-trained brains cringe when we hear variations and misuses of the language simply because of that — we’ve been trained to expect a certain word and a certain pronunciation of that word. The relatively new “Phoneglish” is now providing a fast, code-based way to communicate using two thumbs and a phone. We supplement our communications with “emoji” to convey the feelings that are absent in digital communications and we are now using them in addition to the word in couplets — word plus image together. When legislators contemplate social change initiatives that affect Americans on a broad scale, however, they must also template those changes against the time-honored principles that keep us from a national unraveling: The U.S. Constitution, the Declaration of Independence and the rule of law. Yes, we are changing and changing fast as a society. No one person or group of persons will be able to stop this trend nor reverse it. You cannot go back — only forward. Our ever-changing present has absolutely nothing to do with the political liberal versus conservative arguments of the day. It has everything to do with the grand nature of human existence. Nevertheless, we do need reliability. 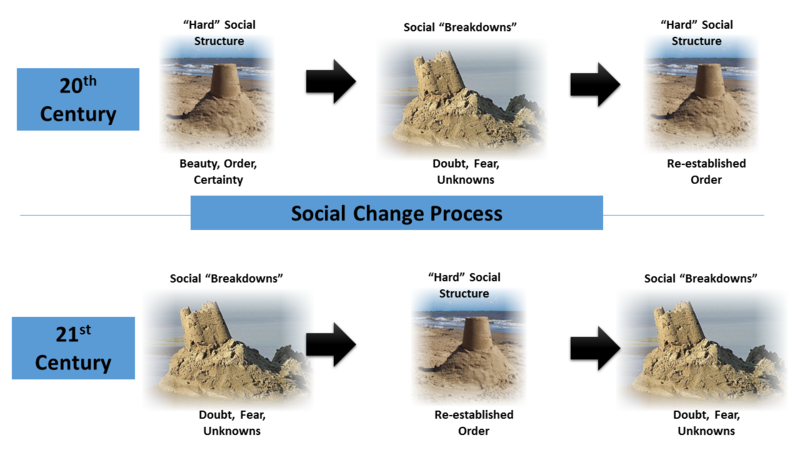 When we can no longer trust our social institutions to deliver reliability and expected results, we risk movement to doubt, fear, and chaotic behavior. Trust that creation was and is magnificent and that no amount of human tinkering will change that. Live on the breaking edge of the future as it emerges every day — in the present. This meets your usual high standards (may even surpass those standards on some of your excellent points!! JBS Public Institute Must be very proud to have your leadership. I certainly am.proud to consider you as a very good friend. Well done with this article! Let’s get people back to the basics. Focus your actions on servant leadership…Go plant a garden! Go feed the needy! Another poignant and well-written article from Bob Brescia.